Wondering how to write a novel? Wondering how to outline your novel? We could give you tips … but we’ll show you instead. An intimate peek into the process of writing a novel, from A to Z, with nothing held back. Part hero’s journey, part crash course in storytelling by the modern mavericks of indie publishing, and the bestselling authors of Write. Publish. Repeat., Fiction Unboxed offers something that’s never been offered before: a naked look into two writer’s process as they wrote and published a book in 30 days, from scratch, in front of the world. In 2013 Sean Platt & Johnny B. Truant wrote and published 1.5 million words (a Harry Potter series and a half’s worth of fiction). The next year they showed the world how they did it. In May 2014, Johnny and Sean, along with their third partner David Wright, launched a Kickstarter campaign to see if their fans wanted to see how they wrote behind closed doors. They promised to start their newest project without knowing their story, characters, or even their genre, and publish the final draft before their 30 days were up. They promised to capture every email, every story meeting, and every word from every draft. They promised to show every molecule of their process, warts and all. They had 30 days for their fans to green light the campaign. It fully funded in 11 hours. 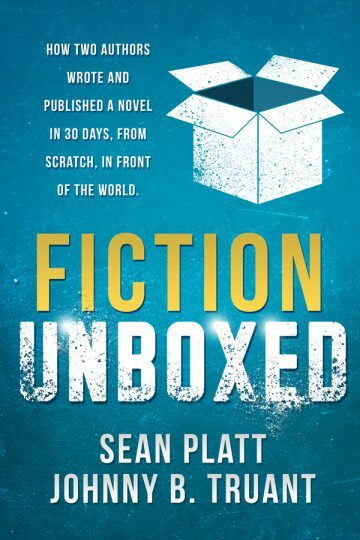 Fiction Unboxed is as revealing as it is inspiring, engendering new levels of creativity in and empowering readers and writers as much as it will entertain them. With actionable advice that will benefit any writer, this book is a true gem for anyone who loves a well told story.